Starting in a strange cell, you need to explore the area and rescue the scientists and security guard. Be careful, as there is an assassin some where in the area too. I highly recommend using MapTap to run this map. You MUST have the latest version of MapTap installed before using this link. Copy j2000.bsp into your gearbox/maps folder. Open the console and type map j2000. Yes it’s short. But at least it works. Intentionally dark. Creep round the corners, kill the grunts. Not easy, not very hard. 5 mins play. This is a terrible map. It’s all out of proportion and the gameplay is very plain. I don’t know if saving both scientists and the security guard change the ending, but I don’t really care. Avoid this map unless you have to play everything! The 20 minutes playtime is because I explored a lot in case there were hidden passages etc. Do you have version 2.3? Have you tried downloading the megapack to your HDD and installing from there? To be honest, I don’t think that will work because Unq has had the same issue, but it works for me. Maybe, I’ll take it offline and just post the individual files until we can better test it. Oh Phillip precisely you read my mind, I download the HD Pack for my steam Op Force, because it seems I had the old models for my Op Force, but that didn’t seemed to work related to Map Tap, anyway, is fine, I think im all right just download them one by one, thanks! Only ok enough if u want to play ALL the Op Force maps and mods available, this is a MAZE style map, and its evident the author wanted to play with the green light and the darkness, it feels like a poor experimental map from a rookie developer. thats all. When Phillip gives an AI you know it must be bad and sure enough it was! To be fair this is only 257kb unzipped, but it should never have been been released into the wild. At a guess I think this is a first effort after learning the basics mapping. Gameplay is almost non-existent in a monotonous environment, but at least you can kill a few grunts. Hold on a moment! this is Opposing Force you’re a grunt as well!! Installing this map was more fun than playing it. Literally all there is to is is a handful of corridors and some randomly placed NPCs. I could go on and talk about the bad coloured lighting, lack of triggers etc but it’s really not worth the effort. The only vaguely interesting thing was the bit at the start where we had to fight without a suit telling us our health. Also a breakable wall. There is absolutely no reason to talk about this map. It seemed like someone took a RandMap map and tweaked it a bit. There were no triggers or Scripted Sequences. It’s just a killbox with corners. 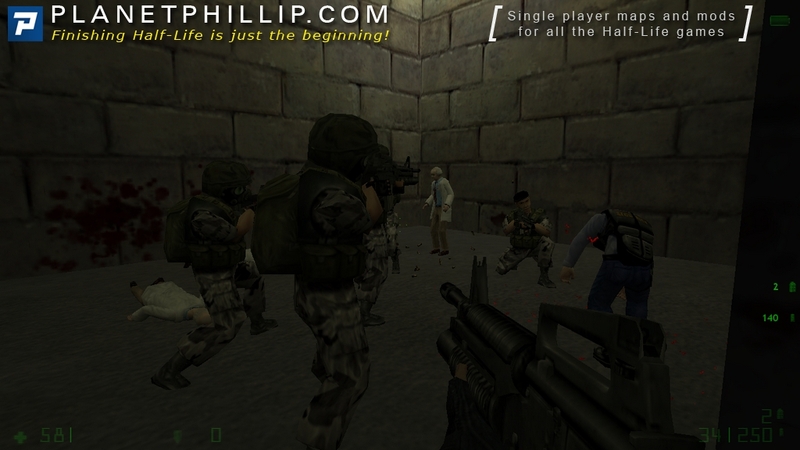 It breaks the first rule of Half-Life mapping: Never put the player into combat before giving them a Suit (there are some exceptions to this rule though). 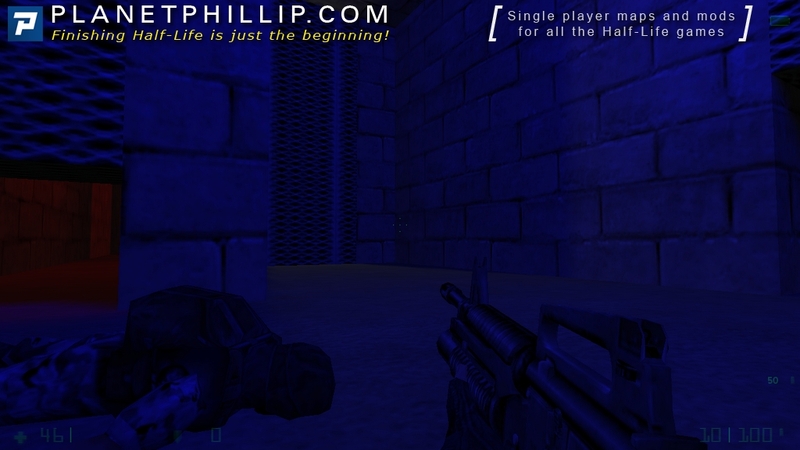 I’m pretty sure that this is an HL1 map that was said to be an Opposing Force map because it doesn’t have any OP4 exclusive content (why weren’t you fighting Massn’s?). I can’t even say to play this if you want to play all OP4 maps because it isn’t an OP4 map. We go through few tall corridors made from big bricks, with white, blue and red lights going out of nowhere. 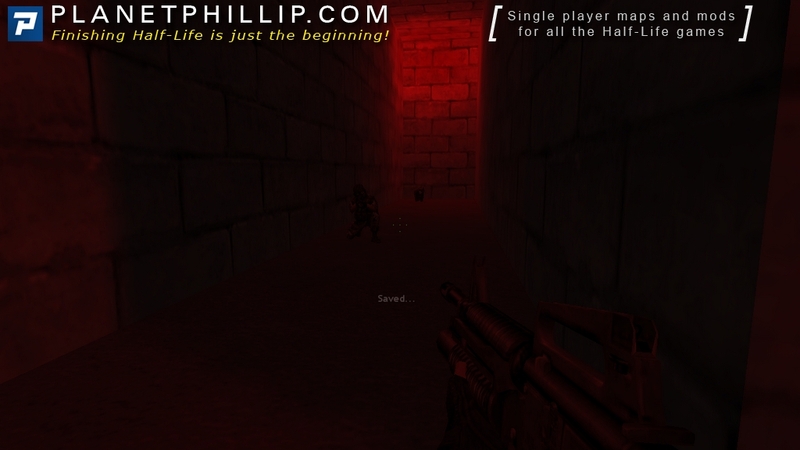 We encounter hostile soldiers from Half-Life, a ninja behind breakable door, and crowd of hostile soldiers, few scientists and Barney in the end. After that we find a barrier which we can’t jump over. If you noclip to get on top of if, you will die, and the vest will show fire hazard. It’s just a small testmap made to learn the editor. It shouldn’t have been released, because it has no aesthetic value in it. Maybe the author thought that hostile soldiers look original in Opposing Force, but there’s no story and no reason for them to be here. This shows every sign of a newbie mapper releasing a first test map. 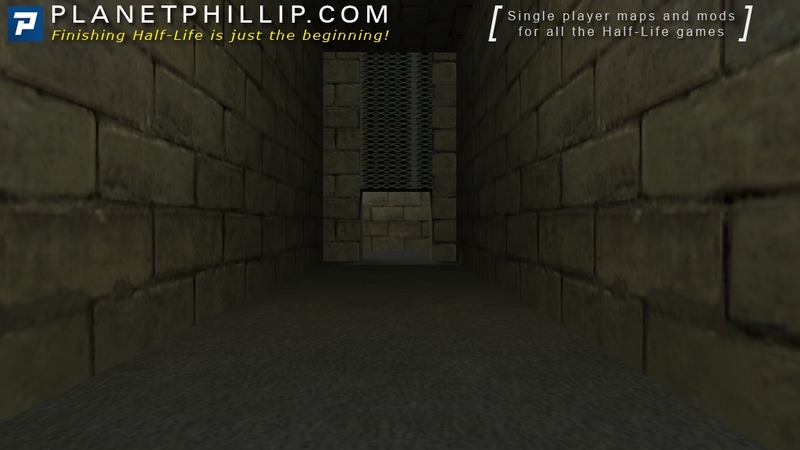 Terrible design, awful lighting, linear path, hallways and rooms that are blocky and out of proportion. You can’t even call it a maze since there’s literally no choices for you to make except not to play which is the best choice. I agree with the above, there’s no reason this should even be an Opposing Force map since none of the content is used. Not much else to say, this map is honestly awful and you have no business playing it. *sigh* I don’t want to be a jerk as this is obviously the first map this mapper has ever made but, there really is no point to this map existing. Its short, pointless and feels weirdly unfinished with the out of place sand textured block at the end of the map. Like Phillip said only play this if you want to play everything.